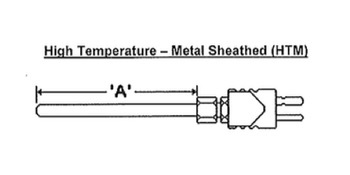 There are many arrangements of Noble Metal thermocouple assembles that utilize combinations of protecting tubes. 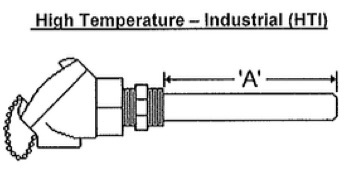 thermocouple elements. terminate and mounting options. 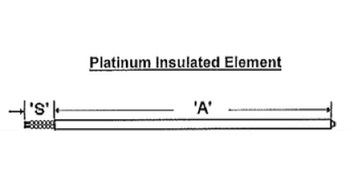 They are categorized into High Temperature Metal sheath (HTM), High Temperature Industrial (HTI), and Platinum Insulated Element (PIE) assemblies (see below). Noble metal thermocouples are relatively expensive units that are easily contaminated so proper protection from harmful atmospheres is required In order to get suitable service life from the assembly. Platinum & Tungsten-Rhenium 24 ga. (.020) and 30 ga. (.010) thermocouple elements have welded junctions. Insulators are round double bore alumina. Thermocouple protection tubes are available in Alumina. Stainless Steel, lnconel, Molybdenum, Platinum, Platinum-Rhodium, Tantalum, and Titanium. All sheath assemblies are evacuated and back filled with inert gee to hinder contamination. Noble Metal thermocouples tolerate higher temperatures and provide greater accuracy than base metal thermocouples. Typical application would include: let engines, rocket engines, turbines, exhaust gas sensing, glass manufacturing, heat treating, laboratory research, nuclear environments, power stations, vacuum furnaces, and more.